The truth is that RV’ing isn’t all random roadside adventures, sunsets and happy hours. It has many frustrating moments, many stinky moments (literally, they smell bad), many head-scratching moments, and a few “I quit RV’ing” moments. Most everyone that will read this has been thoroughly exposed to the glamorous side of this life. This post will expose some of the not so fun truths that are common knowledge among RV’ers, but rarely talked about outside our circles. I believe the reason that these moments are kept on the DL (down low) is multifactorial. One is that folks in general don’t broadcast their problems unless they believe it will fall on empathetic ears. Secondly, as a non-traditional group, full-time RV’ers don’t want to be viewed as though they made a poor lifestyle choice. Here’s one thing to remember: we ALL have problems. Most of us just trade one set of problems for another. So this article may be of particular interest to those contemplating the full-time RV lifestyle under the illusion of how grand life will be once their house has wheels. While this is the unique attraction to RV’ing for most folks (save the few that decide to park a nice $300,000 rig in one spot and build structures around it), it also causes a bunch of problems. Think about it this way; if you were to take your current sticks ‘n’ bricks dwelling, slap some wheels and axles underneath it, drop an engine on your back porch, and take it down the road at 65 mph, there will be issues. The road vibration alone is enough to break down most structures. Obviously RV’s are created with this in mind, but it can still wreak havoc on nearly everything in and on board. By definition, these are “recreational vehicles”. Otherwise, I guess they would be called “mobile homes”, although that name seems to be taken already. RV’s are created for the purpose of taking family trips up to weeks or months at a time, not year round living. While most components will stand up to years of constant use, you have to expect for things to have a shorter usable lifespan and to wear at an accelerated pace versus their stationary counterparts. Part of this relates to the point above: our new Samsung TV is the same thing we’d put in a traditional home, but I don’t expect it to last as long in this mobile environment. The other part is that RV specific products are generally not built to the same standard as household products. This is possibly due to the manufacturer not anticipating constant use and/or the RV market doesn’t demand or expect as high quality of products as the mainstream consumer. In this modern age, we’re used to very predictable and uniform products. If you go look at two new Honda Accords on the dealer lot, they’re going to be identical (assuming they’re equally equipped). RV’s however, can be much more “one-off”. Our 2008 Discovery 40X can be quite different from another 2008 40X made just months later. These are largely made by human hands, using hammers and screwdrivers – not autonomous robots with crazy lasers. The quality of a certain part may come down to how hungover an individual was on the day of production. Other factors include what the manufacturer had on hand the day a part was installed. I recently replaced some ridiculously poor refrigerator drain lines that had come from the factory – I can only guess that the vinyl tubing I used for replacement wasn’t on hand the day they installed our fridge, because it was the obviously superior choice for basically the same cost. Manufacturers often make mid-year changes as well. Fleetwood decided to try electric Power Gear jacks on our unit, but then switched back to hydraulic while still producing 2008 models. I have never spoken to any RV’er who has a clear to-do list, myself included. I’m extremely type-A personality and I HATE to have things hanging over my head, but I’ve had to learn to prioritize and leave some things sitting there for a rainy day project – I currently have no hot water at the outdoor kitchen. Otherwise, I would do nothing but run around fixing things. Honestly, I don’t think this is much different from home ownership, just may require some different skills. When water pumps go bad… at midnight. Being as logic-based as I am, I am constantly dumbfounded at how things seem to go from working fine to non-optimal operation with absolutely no apparent cause. I’m sure I’ve listed enough reasons above to be a catch-all for this, but it’s still crazy to me. Example: we leave a park in the late morning and the jacks retract just as they should. We arrive at a new park two hours later and one jack has managed to have its brake corroded to the point of being frozen – how did that happen in two hours of non-use!? Remember, I’m not a mechanic, carpenter, engineer, or electrician… just a triathlon coach trying to figure all this out. I hope that even the most naive prospect will already know this, but it’s worth mentioning. Even when things are working properly, it is not a fun job to deal with the waste water tanks. It stinks, it’s unsanitary and it’s 100% necessary. The project becomes much less enjoyable when there’s an issue… knock on wood. Even a light sprinkle will be very noticeable when it falls upon the roof of an RV. Heaven forbid a driving rain or any hail – I’m not sure God has made a person who’s able to sleep through that! This mostly applies to motorhomes, although we’ve seen towables with stuff stuck on the back or even a second trailer. In our experience, anything you put back there is going to age at an incredibly fast rate. We have a scooter, two bikes, and our Chevy Spark all on the back of Lucky when we roll down the road. Imagine tailgating a semi truck about seven feet from it’s rear bumper and you can get an idea of the whirlwind of crap that gets kicked up back there. Then, add in the blowing air from a rear radiator diesel pusher for good measure. We’ve come to look at all items back there as disposable. Unless you plan to continuously driveway-surf between friend’s homes, you will probably not know a single soul when you arrive at a new location. This creates a great opportunity to meet a like-minded, but incredibly diverse section of the population. I would highly recommend RVillage for those who aren’t super comfortable walking up to the neighbor’s rig and asking them to be friends for the next week. So why does anyone choose this? By now you may be wondering why anyone would want all of these problems – that’s not a bad question to have! The truth is that we all hope that the good will outweigh the bad. If you don’t highly value the ability to move at a moment’s notice and exploring new and different things in life, a condo would likely be a much better choice. If you’re not handy, or have aspirations to be handy, then this makes every problem you encounter much more expensive to handle – another vote for that condo. But, if you can accept that you’re going to have some massively frustrating days in exchange for stumbling upon amazing places and meeting all sorts of incredible people, then this may be a worthy lifestyle pursuit. All it takes is about thirty seconds of looking through our Instagram account to see why we do this. It’s the moments that you don’t expect or anticipate that blow your mind. It’s the times of strife that make that sunset look that much better. And it’s the satisfaction of knowing that you are a self-contained, mobile, modern-day nomad. As a born salesman, I take it upon myself to set proper expectations. Please do not let this or anything else discourage you from pursuing a dream of non-location-specific living. There are thousands of people out there doing what you want to do – get after it!! Thanks Ryan – great website and post. We have a shield for our Honda Pilot, but have not used it yet since my co-pilot drove it out to Florida and up to New York for our first trip as full-timers. It will definitely be used for our trip to Maine next month. We also hope to replace the TV with one we saved when we sold our bricks and sticks house later this month or when we get to Maine. Trippin’ Engles Jeff at RVBuiltForTwo.com. Hey Jeff, thanks for checking out the site! Just from reading through your reviews, I would guess you and I could have some good conversations on RV products. You seem to enjoy the researching as much as I do! Feel free to reach out with any questions you come up with – we haven’t been doing this much longer than you guys, but it’s a steep learning curve. Safe travels! Great blog post! We are full timers and just moved into our brand new RV and still experience issues in a new unit! BUT we love this lifestyle. Keep up the good work. Thanks, Susan! Congrats on the new RV! Love it. I am not there yet but I usually analyze things to death and try to think of worst case…expect the worst and you will always be prepared. I am not a pessimist at all but I want to work it through in my head so I make a more informed choice on rigs and toads and in the end try not to make it such a crap shoot. Thanks for sharing this perspective, it adds value for sure. Thanks for reading! I also think I am viewed as a pessimist, but to me it’s just being realistic. Stuff happens… That’s a truth and it’s only horrible if you’re not prepared for it! I hope it was helpful, Tanya! We started out thinking we’d get by with a scooter as our only “toad”. Unfortunately, we found out quickly that we had a desire/need for more. 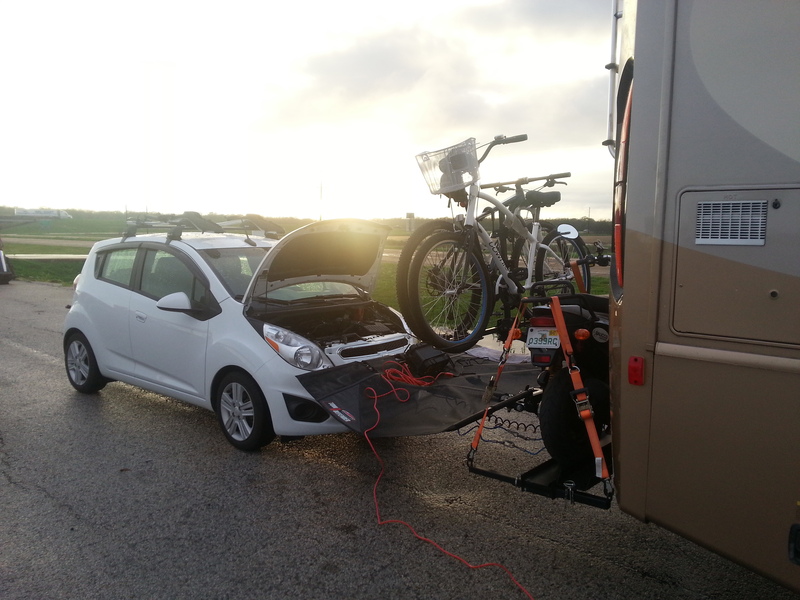 If you’re interested, I did a writeup on our Chevy Spark in the “Our Sparky Toad” article. Cheers! I don’t know that I would necessarily think twice about having a tow vehicle with a Class A. Without a toad, we would severely be limiting our mobility. It’s just good to have appropriate expectations about the damage that can occur. This can also be mitigated with various types of toad protection devices, just like the one Ryan has pictured. We had an UltraGuard (one huge mud flap, essentially) installed at the back of our RV to help cut down on the number of rocks it kicked up at our Jeep. You guys are awesome! Thanks for sharing the no-so-pretty side of the full-time RV lifestyle. We’re not quite there yet, but have no illusions of magical unicorns keeping everything right and clean. It is refreshing to hear from folks who are willing to share their reality with others. This was well-written and very true. We are full-timers who do share the down side of the lifestyle, and my husband has an entertaining voice when he writes, so at some point when you are in between jobs on the “to do” list, pop over to ajhomeontheroam.com and read some of the “truth” stories we’ve shared. Hopefully, we’ll meet you down the road somewhere. If you’re going to the Escapade in Vermont, then maybe it’ll be there. Our intent is to go, things going close to plan. I’ll definitely check it out!! “Misery loves company”, right!? Haha! We don’t have current plans to be in Vermont, but you never know. That’s one of the fun truths – everything can be changed to our desires!